There was an interesting pair of articles in io9 last week, the report of double muscled pigs being bred by researchers in South Korea and China, and differences between how American scientists and the American public view science related issues. Seeing these two articles so closely together was interesting. The first thing that jumps out is that in America, there is a 51 percentage point gap between scientists and the public regarding whether or not it’s safe to eat genetically modified foods. You can play about with the day at the Pew Research Centre’s site where they have a fun inforgraphic to demonstrate how this changes with gender, age, science knowledge, etc. The story of the double muscled pigs then should evoke some concern in these people, no? Scientists meddling where they don’t belong? But of course double muscling is old news – in fact we understand it pretty well. It’s a genetic mutation that inhibits the production or uptake of myostatin, a muscle growth regulator. So these animals have big muscles. 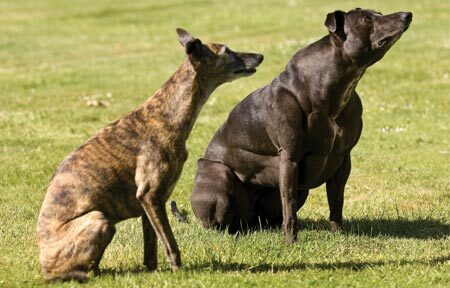 There are a few breeds of cattle that have been selected for this mutation, such as the Piedmontese breed, and it’s a mutation that occurs in some whippets too. Deliberately adding the gene in a line of pigs is cool, but we also have pigs that glow in the dark. The concern about double muscled pigs might come from the idea that humans shouldn’t genetically manipulate animals, but seeing as we’ve been doing it for a long time, I think it’s more the tool that some people object to. This innate distrust of the mad scientist. But what really interested me in the double muscling article was the assertion that this development might help feed the world. I agree that it could, but not because we’re suddenly doubling down on our bacon production. After all, the world’s beef production isn’t purely carried by the Piedmontese and Belgian Blue (although they are important breeds). But the technical capacity we have to engineer our animals, with appropriate ethical supervision, really will help us in one of the theatres of world food production. We just need to overcome that 50% point difference between us and the public to help us get there.